hatter is the latest entry into the small world of block-breaking action/puzzle games. Much like others in the past, such as Breakout or Arkanoid, the main objective of the game is to clear the screen of all destructible obstacles using a ball and paddle. Shatter spices things up a bit, adding new gameplay elements, faster action, and various modes of play. Simple, yet stunning.Typically, games like this place your paddle at the bottom of the field with all of the bricks above you. 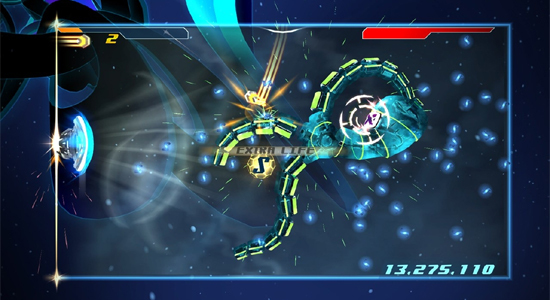 Shatter not only uses this classic style, but also has stages where the paddle is on the left side of the screen and on an arc in circular stages. Some of the destructible objects within the game are not stationary and will start floating around the field when they're not attached to certain other objects keeping them in place. If one of these objects hits your paddle, you do not lose a life, but are knocked off the screen and disabled for a moment. You also have a vacuum-like power which allows you to push objects away or pull them toward you, including the ball. This is a really neat feature and sometimes essential for winning, especially during boss battles. The visuals in Shatter are simple, yet stunning. The bright, vivid colors are attractive but can be distractive occasionally and you may lose track of where the ball is. The HUD is designed well and doesn't get in the way of the play field, either. Power-ups have been a key factor in this genre since their inception, but in Shatter there are very few. The ones featured in the game all have a positive impact. There are 1ups, shard-doublers, score-multipliers, and one which makes the ball more easily maneuverable. Other features of the game make up for the lack of power-ups. You are allowed to put multiple balls into play, but you have to be careful because each costs a life, although if you're good enough to keep them in play you can clear the stage much faster. Another thing to note is that the balls will ricochet off each other rather than just passing straight through one another. When you destroy objects in the game, shrapnel will break off called shards. When you collect the shards, either by letting them float into you or vacuuming them up, a power meter fills up. When the meter is filled you get to unleash a furious attack called the "Shard Storm" that will destroy everything in its path. The "Shard Storm" is not as powerful as the balls themselves, but covers a much wider area and can destroy multiple objects at a time. seem cramped.At the end of each of Shatter's 10 levels there is a boss battle. The bosses are difficult, sometimes having a hard to reach weak point, and each one has a unique strategy to defeat. After finishing the boss battle, you move on to a bonus round where you try to keep three balls in the play field for as long as possible. Each time a ball is hit it speeds up, and eventually starts pulling toward you as if you were using the vacuum physics. Once you finish the story mode in the game, you unlock "Boss Rush" mode in which you are pitted against every boss back to back. There's also a "Bonus" where you simply play the bonus round of the game to see how high of a score you can get. Another area where the game shines is its soundtrack. Over 90 minutes of music spanning thirteen tracks of fresh, retro-inspired techno and rock music compliment the game very well. At a mere $8.99 this game is a must-buy for Playstation 3 owners.